TGIF friends! Doesn't it seem like these weeks are flying by? How is it already almost the end of April? Our friend Ashley from South Carolina is coming to stay with us this weekend for her birthday, which happens to be today! Happy birthday, Ash!!!! We also have something fun planned on Saturday that has to do with old homes in the downtown area that we will talk about next week. What are you up to this weekend? Where are you from? We were both born and raised in opposite sides of Texas. Both from rural towns, Anthony is from Linn in south Texas, and Austin is from Eldorado in west Texas. Where do you live? We both live in Austin, Texas now. Relationship status: Dating, coming up on 4 years. What is your favorite place you have traveled to and why? In August Anthony surprised Austin for his college graduation with a trip to Puerto Rico. This trip was significant for us in many ways including celebrating our third anniversary together and it was also the first time that we traveled together without friends or family. We instantly fell in love with the culture surrounding the island, everyone on the island embraces differences and celebrates life in such a unique way...not to mention the delicious food (Mofongo – if you don’t know what this is, look it up! You won’t be disappointed). This will forever be a very memorable vacation for us not only for the beautiful destination, but also because of the important milestones in our lives together. How did you guys meet? Who asked out who? We met at Texas A&M University. Our first date was on August 23, 2014 at Sonic Drive-In. Anthony had a strawberry limeade and Austin had an ocean water. We sat in Austin’s car for a couple of hours and talked all night. After Austin ordered the second round of tater tots, I knew it was love at first bite. We actually consider this day our anniversary since we have been dating ever since and no one officially asked the other. We’ve had many more tots since then. How did you know each other were “the one”? We have always heard, “when you know, you just know.” And this is definitely true for the two of us. After a few days of knowing each other, (4 to be exact), Anthony had a drink or two and let the words “I love you,” slip out. Of course, these words can either really freak you out, or let you know that you feel the exact same way. Being that drinks were involved, we decided to wait and see if the feelings were still there in the morning. Knowing that you have found “the one” is such an incredible feeling, and it comes with loving and growing together through the pains of life. Our lives have had plenty of pains, but we are lucky enough to have be each other’s “ones” to get through it all. Any big plans for the future? Where do you see yourselves in 10 years? We both love living in Austin, Texas but wouldn’t be opposed to trying out a different state or even country together. We’re both fairly new to the “adult” world and are still figuring it all out. In 10 years, buying a home, marriage and starting a family are all in the plan. But for now adopting a golden retriever may be the best place to start. How would you describe your home decor style? Mid-Century modern with classic and artisanal touches. We both love design and décor and take pride in our home being a reflection of who we are creatively. Our goal is to always make sure our guests feel at home and comfortable. While we don’t always initially agree on the same style choices, we somehow manage to come to an agreement that we are both pleased with. What is the last show you binged watched? Schitt’s Creek. If you haven’t seen it, then please change that. How do you guys handle arguments? We hash it out for a few minutes and both get a little sarcastic THEN we realize how unreasonable the argument may be, and take a moment to breathe and talk it through. We usually sit down and talk about why one of us became upset in the first place and why the other may have made the situation worse. After that, we try to establish things we will both work on in the future to avoid a similar situation. A kiss usually seals the deal. How old were you when you came out and what was your experience like? Anthony – I was 20 when I came out to most of my friends in college and was 22 when I came out to my parents. I grew up knowing love and support and that hasn’t changed. 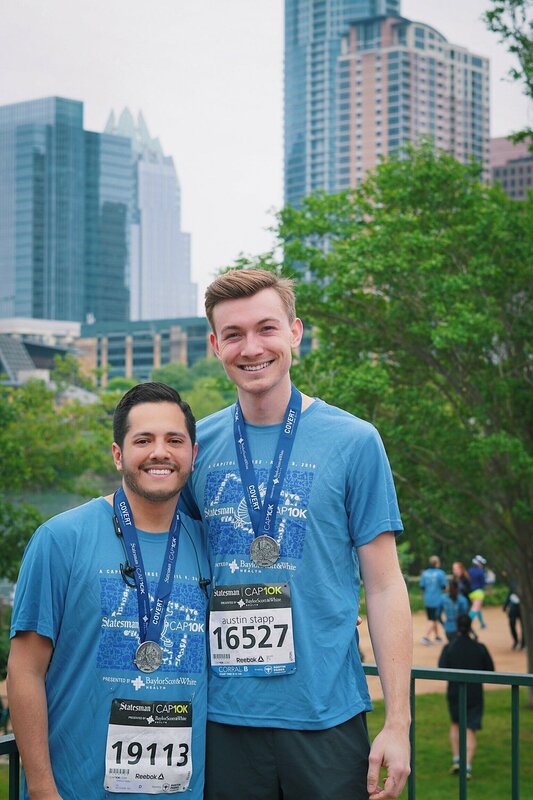 Austin – I came out to the majority of my friends and family when I was 19. Both my friends and family have met me with love, understanding, and acceptance. I have been very fortunate. Have you faced any backlash as a couple since coming out? If so, how do you deal with that? We have both been lucky enough to have a strong support system that loves and accepts us. Though every coming out experience has its trials, in the end we have realized that those who love us are happy to see us be ourselves. In the difficult moments, we remember that we cannot be the best version of ourselves unless we can forgive others, accept ourselves, and work towards acceptance for all. We truly believe that love conquers all. What is your favorite thing about one another? 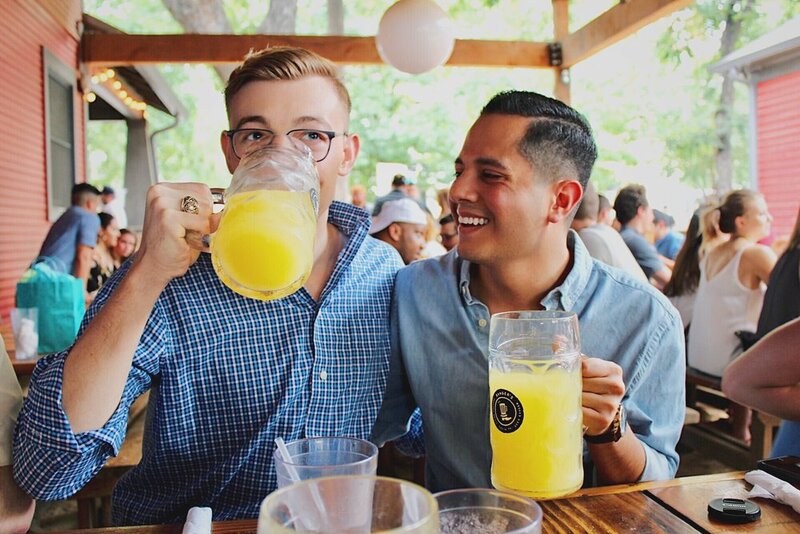 Anthony – My favorite thing about Austin is his willingness to always make someone smile. He will go out of his way to make sure those around him are happy and have a reason to laugh. I guess you can say he has a pretty contagious smile. When there’s a special occasion or even when I am having a bad day, he’ll do this thing where he’ll throw me a “party” and cooks or bakes, decorate the entire apartment in balloons and streamers and sometimes even a banner and makes everything about me. It’s definitely very silly but it never ceases to make me smile. Austin – My favorite thing about Anthony (oh goodness how will I ever decide! )…My favorite thing is his compassion for others. He is always willing to go without, give his, or check on someone when he knows they need it most. He is a loyal and fiercely faithful friend, has an electric presence, and a giving heart. He meets strangers and friends with that beautiful smile, lights up the room, and makes everyone feel important. I am very blessed to know and experience him in this regard and so many others.